Paris is a veteran in the world of graffiti, long loved in his home town of Bristol, not only work his work but for bringing the beauty of street art to the youth of his City. 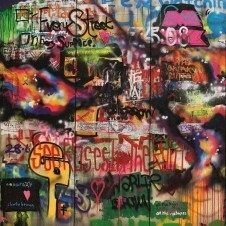 It was in this aspect of a teacher of graffiti that Paris was first introduced to Coldplay – initially being told he was to meet some band to teach them graffiti, much to his surprise when he walked in that room and found Coldplay as his students. Paris so impressed the band that what was initially to be an instruction session turned into more than a year long project with Paris directing and doing much of the work for the bands worldwide number one album Mylo Xyloto, as well as painting the albums imagery on 80 foot concert backdrops, the band’s instruments and even the bands stage for the Olympics closing ceremony.